Recently, quite a few guests have been coming into the shop with stories of their vacations in South Africa. They always mention the mountains, the curious wildlife, and most exciting of all, the wine! South Africa has been making wine since the 1600's, and its winemaking culture has more recently shifted into supporting local co-ops, smaller producers, and expanding an appreciation of wine to a broader audience. This country has loads of untapped potential. Some of its soils are the oldest in the wine world and there are plenty of old abandoned vines for the ambitious future winemaker to discover. Some days you just need a Sauvignon Blanc. It's an upbeat and racy grape that will make you picture the promise of warm days to come. Down in Stellenbosch, Neil Ellis has been making wine for four decades but more recently his kids Warren and Margot have taken over. The vine age varies from 1995-2010 and the juice is settled for three days before being racked and fermented in stainless steel tanks. It is then aged on its lees in tank for three months before bottling. This is full of racy grassiness, grapefruit, and guava notes. The playful cartoon on this Chenin Blanc illustrates a legend of a giant Sea God who rose to the aid of some endangered seafarers during a passage around Swartland. 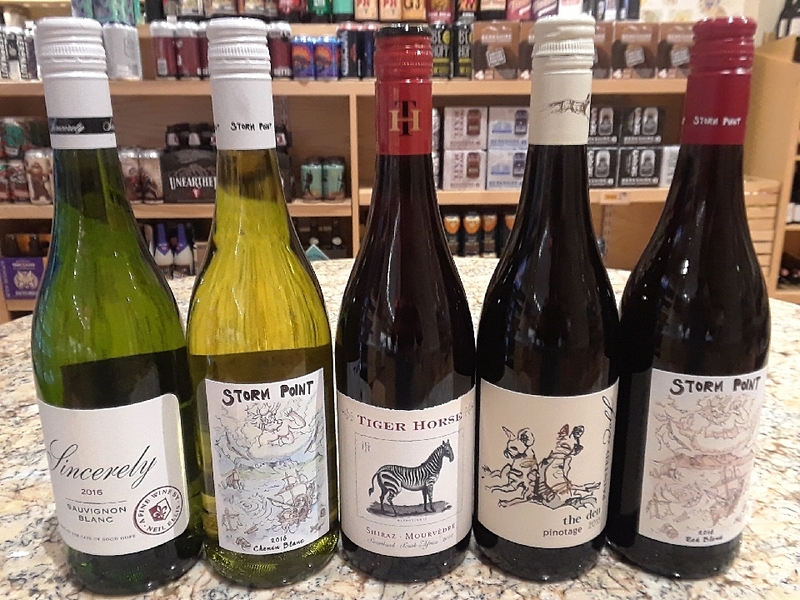 After growing on vines that are between 20-30 years old and aged on its lees for 5 months, this Steen (South Africa's local name for Chenin Blanc) has notes of lemon zest and stone fruit that is tempered by a balanced acidity. Swartland is the coastal wine appellation of South Africa and is determined to be a player in the international market. Young winegrowers have started a Swartland Revolution Festival every November to rally interest and pride in their wine! This Shiraz (Syrah) and Mourvèdre blend is certainly something to boast to the masses. Grown by winemaker Marinda Kruger Van Eck, it has rich, brooding, chocolate, and cherry notes. South Africa is definitely for the artists and lovers; the owners of Painted Wolf, husband and wife team Jeremy and Emma, met when Jeremy worked as a chef. After Jeremy attended Adelaide University, they decided to open their own winery in 2006. Painted Wolf is named after African Wild Dogs (also known as Painted Wolf's) and are the most endangered carnivore in South Africa. Jeremy and Emma believe that their wines are as playful and inquisitive as a Painted Wolf and are committed to helping preserve their habitat. This Pinotage comes from a vineyard on the Agter Paarl and Swartland border and 15% of the Pinotage spent some time in French and American oak barrels before bottling This wine is filled with ripe blackberry and raspberry notes with a warm toasty finish. Drinking this wine will make you want to find your own pack of friends and play! In the wine region of the Western Cape, lies the area of Stellenbosch, which is the hub of South African winemaking! This wine is a mixture of Syrah, Cinsault, and Carnigan grown on granite and shale soil, and the grapes were hand harvested and destemmed before being aged in tank and neutral barrels. It has a cheerful nose of strawberry Fruit Roll-Ups and notes of plum and roses in the mouth.